Scientists working at Arizona State University’s Laboratory for Algae Research & Biotechnology hope that tiny algae will be able to fuel jumbo jets. Now, their research is being spun-off as a $3 million research and commercialization collaboration between Heliae Development and Science Foundation Arizona to develop, produce and sell kerosene-based aviation fuel derived from algae. The researchers say they’ve already moved their work from the lab bench to a pilot-scale demonstration and production project. 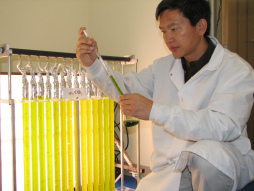 Led by Qiang Hu and Milton Sommerfeld, the research centers on specific algal strains that produce lots of fatty acids that, when de-oxygenated, are very similar to kerosene. The team says its process can produce kerosene cheaper from algae than from petroleum. With a few fuel additives, kerosene can be made into aviation fuel, and with this seed funding, the project will continue development of algal strains specifically for jet fuel at ASU’s new SkySong innovation center. Heliae is contributing $1.5 million for further research and development and Science Foundation Arizona will match that; ASU will receive a total of $3 million for the project. Arizona Technology Enterprises, the technology venturing arm of ASU, will receive an equity stake in the company, including licensing fees and commercialization income. The new venture joins a few other algae-to-biofuel startups taking aim at green jet fuel. Seattle-based Inventure Chemical, which closed its first round of funding mid-2007, told the Seattle PI that it has already created algae-based jet fuel in test batches and hopes to produce up to 15 million gallons of biofuel each year. Kiwi Aquaflow Binomics says it is working with Boeing on algae-to-bio-jetfuel using open-air environments to grow its plants. In the algal-bacterial mat environment described above, a silicate rock substrate rich in Calcium and Magnesium (andesite or basalt?) would, as Calcium and Magnesium silicates weathered, consume atmospheric CO2, and produce ionic Calcium in a carbonic acid solution. The conversion of the Calcium ions into CaCO3 by the algal-bacterial mat would permanently sequester ionic carbon, while the production of fatty acids for reduction to kerosene would convert atmospheric carbon to fuels – a temporary sequestration, but one which recycles CO2 instead of liberating it from fossil fuel sources. Algal-bacterial mats have been sequestering carbon for probably well over a billion years; this is through the production of calcium and magnesium carbonates, as in stromatolites and “algal” limestones such as the Oglallah formation, aka “caprock” in the southern Great Plains. A combined process in which algal-bacterial mats produce oil and sequester carbon simultaneously, using only the sun and CalMag rich substrate or media is concievable and should be investigated. Enclosed environments increasing CO2 partial pressures and temperatures may help the process along – colocating the pools with wind generation in the Plains is especially appealing.